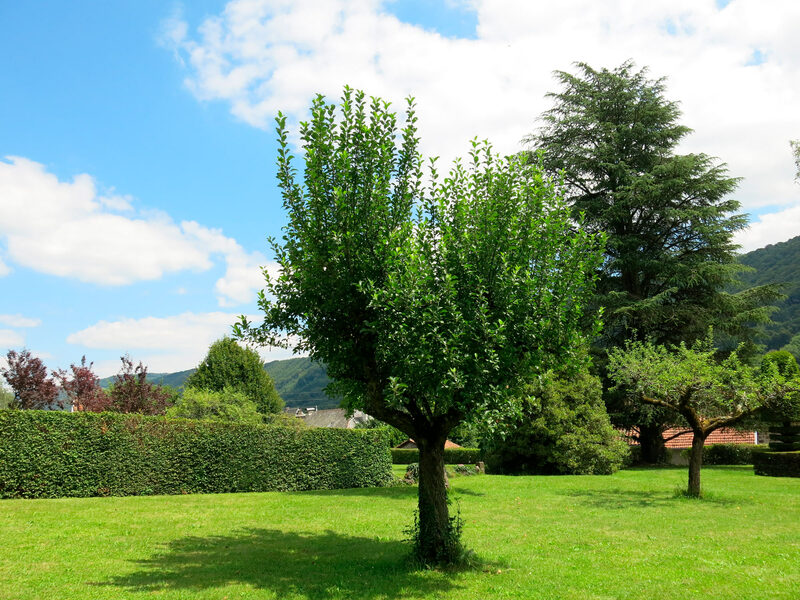 The story started six or seven years ago, when a vigorous and productive russet apple tree was over-pruned in my father’s orchard in the South-West of France by a team of gardeners more used to ornamental gardens than fruit trees. This is the first picture we have of the tree, taken two to three years after it was over-pruned for the first time. Summer 2014, Aurillac, France. Before the tree was pruned, we used to handpick part of the fruit without climbing on a ladder. The lowest apples were at tree trunk height, around 1.70 meter high. No apples could be handpicked without the help of a ladder anymore. More importantly, there were hardly any apples to pick following the pruning. 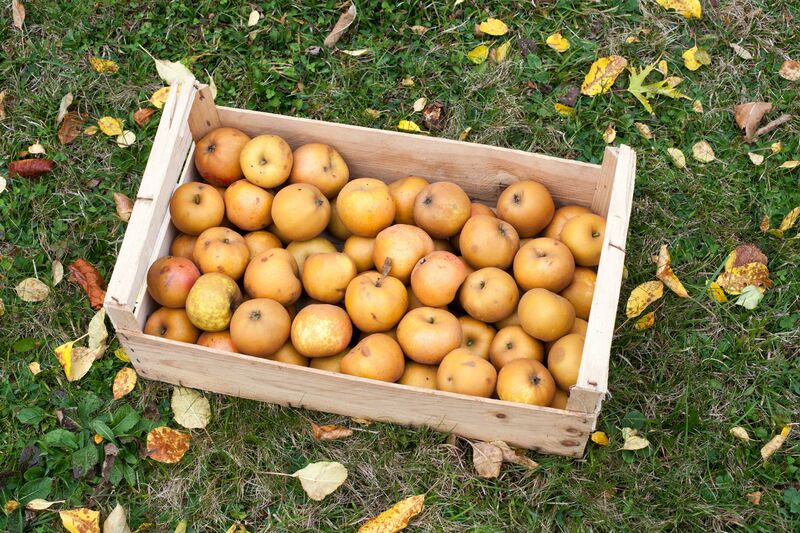 It was only in 2015, a very good year for apples in the area, that the tree started to produce fruit again, however in smaller quantities and of a smaller size. The tree grew vertically, making it more difficult to harvest and prune. 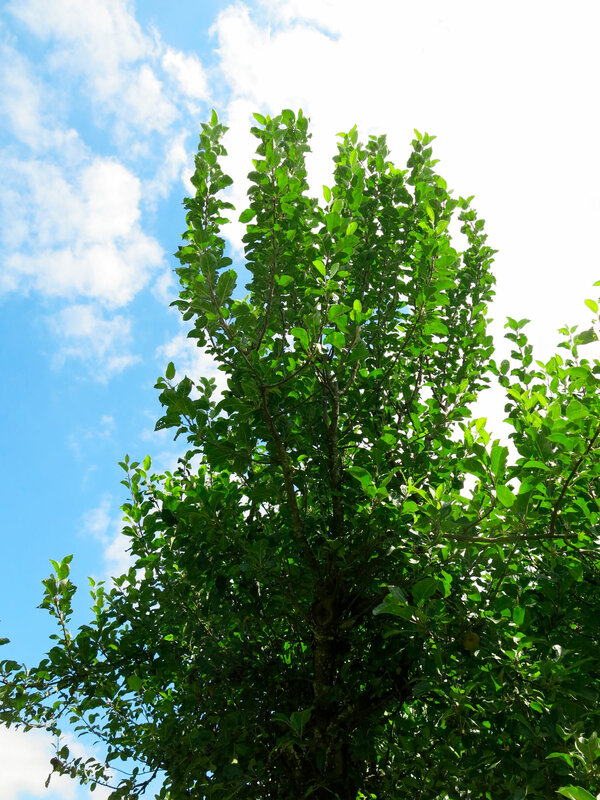 The tree grew wood and leaves inside its vase shape, preventing air and light from circulating properly, putting it at the risk of developing diseases. Vigorous unfruitful shoots inside the vase shape of the tree. Photo summer 2014. The gardeners also cut off big higher branches… Photo summer 2014. … provoking the growth of ‘watershoots’. Photo summer 2014. 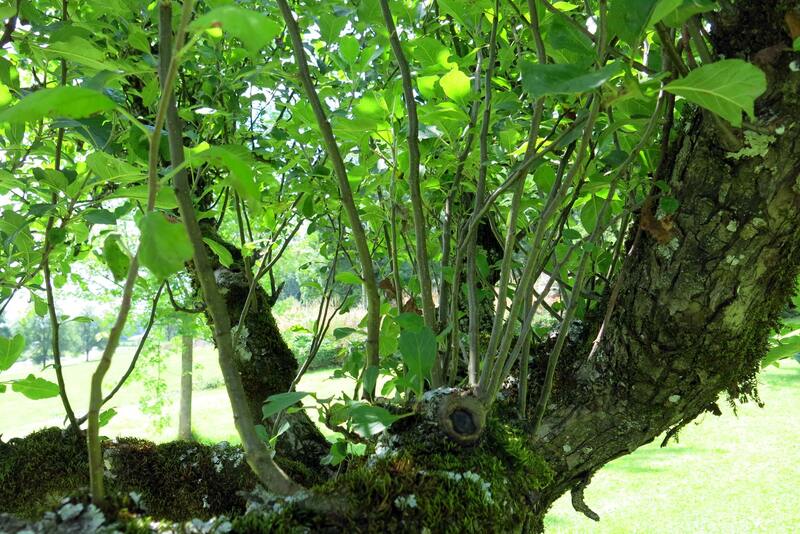 The way this russet apple tree reacted to over-pruning is typical of ‘watershoots’ growth. In its pruning guidance, the British Royal Horticultural Society states: ‘Over-pruning (removing more than 25 percent of the canopy in any one year) may result in the production of watershoots (epicormic growth), which are vigorous, tall, upright and leafy branches, producing no flowers or fruit.’1 This is exactly what happened to this tree. ‘Excessive pruning stresses the tree which will strive to restore the balance of roots and shoots.’1 The tree grew wood in order to restore its lost foliage so that it could feed on nutrients through photosynthesis. This balance of roots and shoots is indeed essential to the life of the tree. 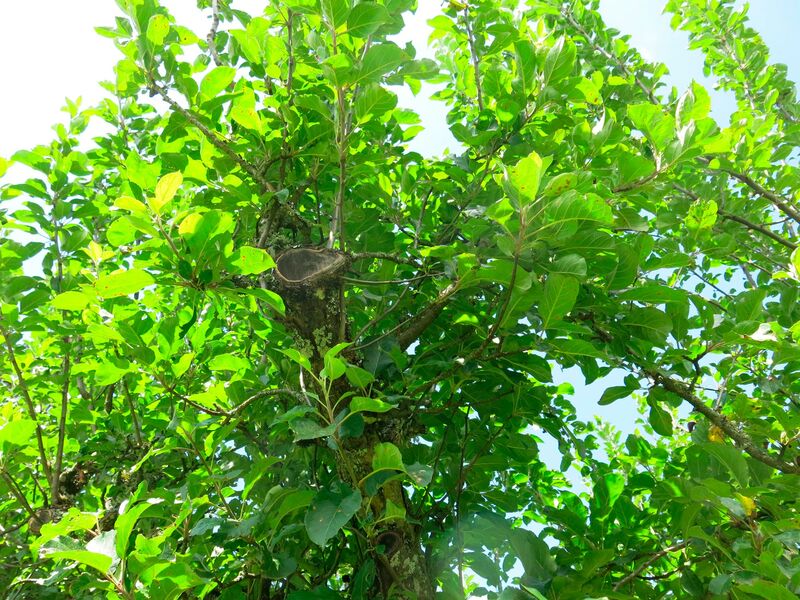 As horticulturist Warren Somerville wrote in his 1996 book Pruning and Training Fruit Trees, ‘The leaves can produce food from photosynthesis only in proportion to the water and nutrients supplied by the roots. At the same time the roots can only grow, searching for nutrients and water and then absorb them, in proportion to the food and energy supplied to the roots from the leaves. The two parts of the tree are totally interdependent’2. The imbalance between roots and shoots created by over-pruning, as explained in a workshop I attended in 20163, makes the tree stop producing fruit for a while. It usually takes three to four years before fructification comes back to more acceptable levels. This is indeed what I witnessed with this russet apple tree. 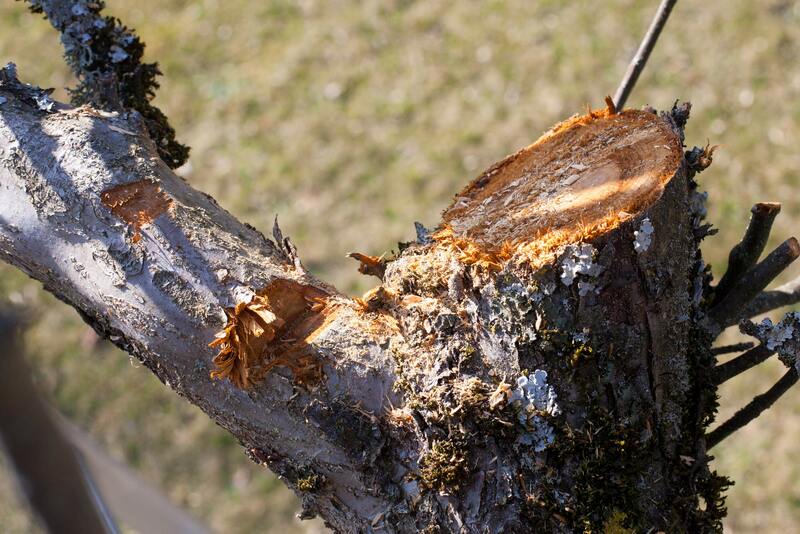 What can be done once a tree has been over-pruned? The British Royal Horticultural Society provides guidance on how to deal with the problem of watershoots in their website page ‘Apples and Pears, Winter Regulated Pruning’4. However, rather than fixing the problem once the damage is done, it is better to avoid creating it in the first place. In March 2016, we tried to address the problem created by the over-pruning of this russet apple tree. We decided to remove the watershoots in the middle of the tree vase, avoiding to cut off more than 20% of the overall canopy. Further smooth steps towards recovery would have been taken in the following years. Before the second bad pruning. Photo 21 January 2017. After the second bad pruning. In principle, a maximum of 20% of the wood should have been cut off. We are more in the area of 70 to 80% of the small and medium branches here… Photo 12 March 2017. The March 2017 pruning was very radical, as sometimes carried out on ornamental trees to stimulate growth. Photo 12 March 2017. Not a clean cut… Photo 14 March 2017. A chainsaw was used to cut off branches of all sizes. Photo 14 March 2017. Other branches were badly scratched. Photo 14 March 2017. Overall, after the pruning the apple tree looked more like a skeleton than a fruit tree. Photo 14 March 2017. Photo 29 May 2017: watershoots growing everywhere… The story repeats itself. How harmed the tree will have been this time? How much energy will it have to spend to try and recover? I find this example revealing of how ignorant and careless humans can be, and what they lose in the process. Indeed, this tree, which could easily produce a hundred kilos of russet apples a year will not bear fruit for quite a while. Some of the last and rather meagre crop we got in 2016. Photo 23 October 2016. Let’s hope that the continuous efforts made to form skilled professional and leisure gardeners, allied to an increasing awareness of the importance of taking care of our land and what it can produce will pay off in the future. Little effort can bring great results, as these quotes from the British Royal Horticultural Society in their page ‘Apple and pears, pruning made easy’5 suggest: ‘A fully pruned tree might only need 10-20 pruning cuts in total’ and ‘A sharp pair of secateurs and quality pruning saw can make all the difference’. 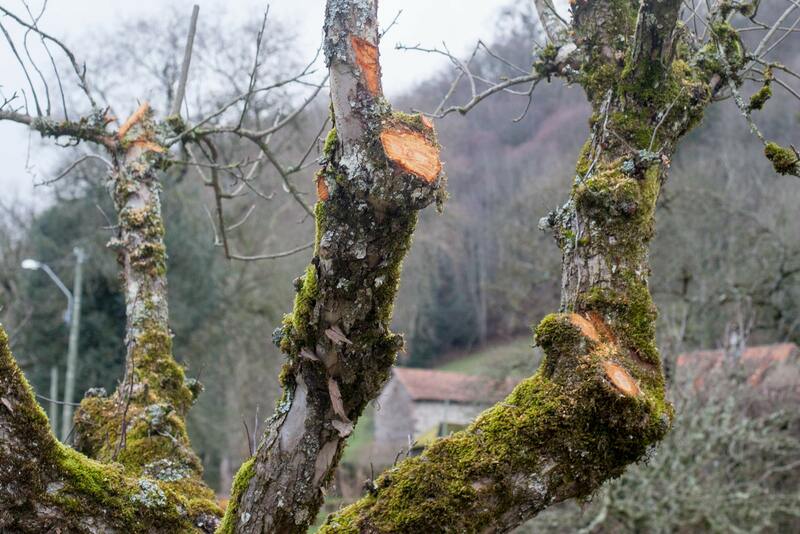 In the case of this russet apple tree, the gardeners didn’t measure their effort and over-used energy-powered technology, their chainsaw, to cut off too many branches. Maybe next time they will use their tools more wisely. 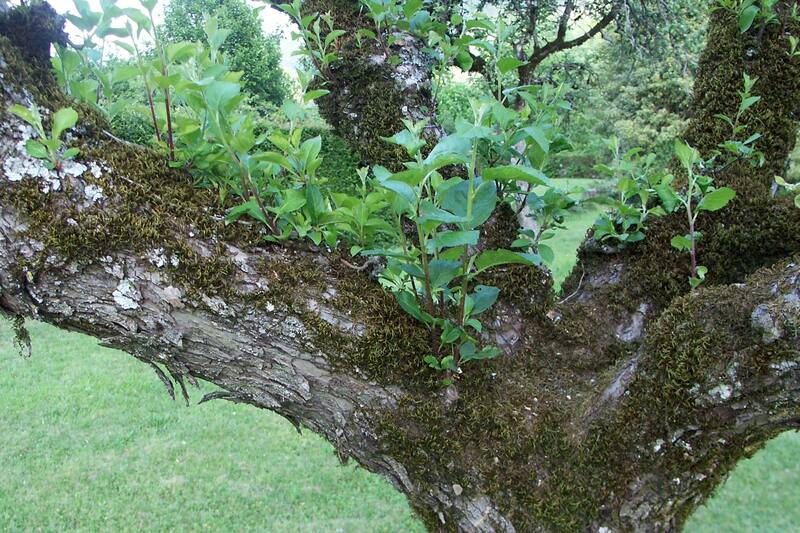 Apples and pears: renovating old trees, British Royal Horticultultural Society website, accessed 28 February 2018. Somerville, W (1996) Pruning and Training Fruit Trees, Inkata Press, p.57 (Google Books, accessed 28 February 2018). 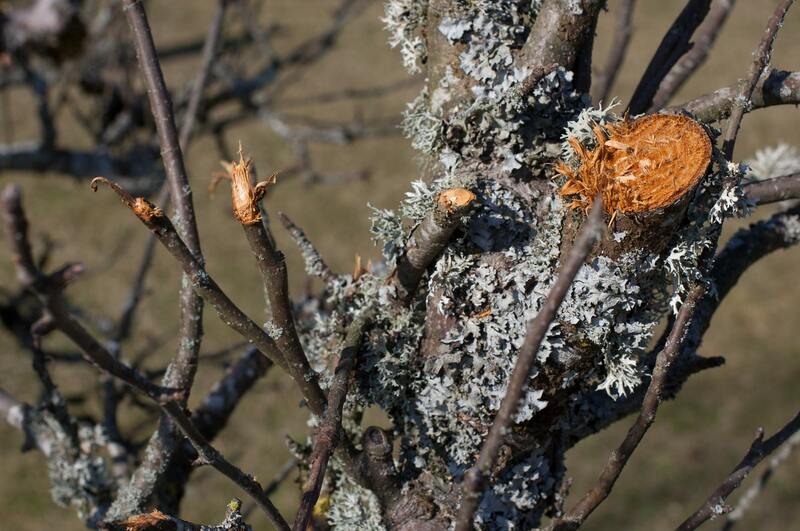 Apples and pears: winter regulated pruning, British Royal Horticultultural Society website, accessed 28 February 2018. Apples and pears: pruning made easy, British Royal Horticultultural Society website, accessed 28 February 2018. 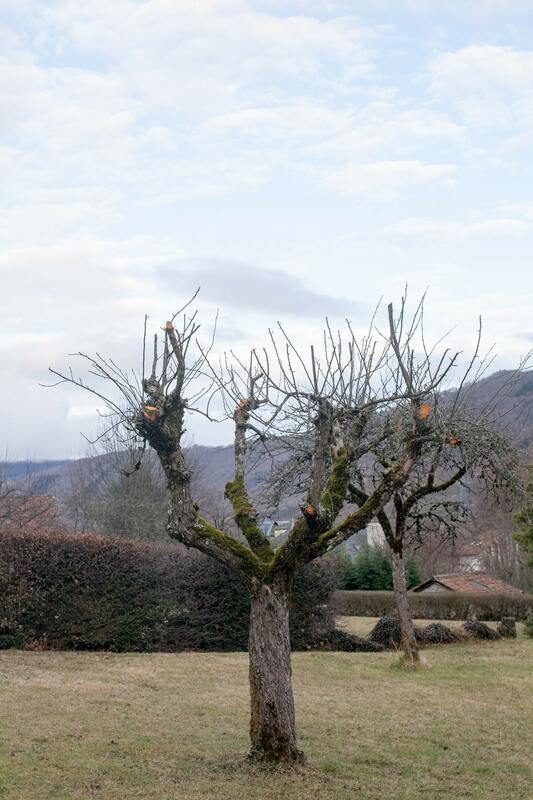 This entry was posted in Grow and tagged Apples, Aurillac, France by Les Jardins d'ici. Bookmark the permalink.